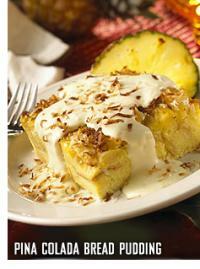 To add some Caribbean flair to you holiday dessert this year try out Bahama Breeze&apos;s Piña Colada Bread Pudding. Top with a Coconut Créme Anglaise and you&apos;ve got yourself a real tasty treat. Time to start a new family tradition! Toss 3 Tbsp of melted butter with the Cuban Bread Cubes, place on a sheet pan and place in an oven at 350ºF and toast until golden. Brush a medium sized casserole dish with one Tbsp of melted butter and add the toasted bread cubes. Mix all the remaining ingredients together and pour over the bread cubes. Press down on the bread cubes until they absorb most of the liquid. Bake in a 300ºF oven for 1 hour or until firm in the center. Serve warm and enjoy! Add the cream, egg yolks, and sugar in a small sauce pan on medium heat. Stir constantly using a cooks spoon until the sauce starts to thicken; about 8 - 10 minutes. Add the rum and stir to evenly mix. Place in a clean container and place in an ice water bath. Place in the refrigerator to chill to 40ºF.